Abid Katib – Palestinian Shoe Fauxtographer? The image on the home page of The New York Times website is startling. A bombed out building in Gaza with a single brightly colored child’s shoe in the middle of the photo. The imagery is powerful, particularly the contrast between the blackened floor and the bright cheerful color of the shoe. But something doesn’t seem right here. As seen in the image, how is it that everything is blackened, except for the shoe? And the shoe is laying flat on the ground, in the middle of the picture, with nothing else around it. Highly unlikely. More likely, staged. So I did a search on the photographer, Abid Katib, and found that he has a shoe fetish, and many of his other shoe pictures look staged. [Note: Due to Blogger technical limitations, I’ve posted the other photos referenced in this post directly below in a separate post.] There is the picture from November 2008 of two children’s shoes in the mud in Gaza reportedly after an Israeli strike. And the photo of multiple shoes and children’s toys close together at the scene of a supposed Israeli artillery shelling in June 2006. And the photo in Gaza of “Bush” neatly written in white chalk on the sole of a shoe during a Palestinian rally in support of the “shoe thrower,” reprinted in the L.A. Times. And yet another photo of similar chalk writing on the sole of another shoe. And Katib just happened to be there at the very moment that a protester neatly placed a shoe over a poster of George Bush – what timing! And again when several protesters in joyful harmony all placed their feet on a George Bush poster on the ground (notice the military fatigues on the “protesters” and the automatic weapon barrel). The best evidence that these photos are staged is to look at the blue ribbon on the poster on the ground with a shoe attached, and notice that it is the same ribbon and poster that was held vertically in an earlier photo. Katib’s photos are among the most widespread, reprinted in newspapers and websites around the world through Getty Images. Maybe he just has unbelievable timing, and happens to be in the right place at the right millisecond time and again. Or maybe this is just part of the Paliwood (also here and here) and anti-Israel fauxtography (also here and here). If the shoe fits, Mr. Katib, wear it. Afterthought No. 1 – Notice the black gown and white veil on the woman in the picture. The stark contrast makes her look like a symbol for death. 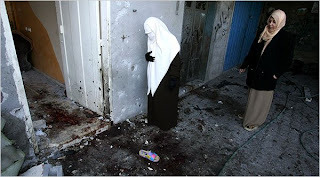 But, for someone under bombardment and walking through blackened ruins, the white veil is awfully clean and pressed. The woman’s black and white attire is just part of the fauxtographic imagery. The white head covering appears to be a white “Saudi-style” burqa, similar to this photo (and this one) by Katib of Hamas-affiliated women. I’m getting more and more amused at how the American media keeps publishing obviously staged pictures and stunts by the Palestinian propaganda machine. I mean the propaganda is hardly a new development, so why does the American MSM continue to make their work so easy and accessible for the last 12 yrs or so? Surely, it’s not merely foolishness. What happened in the last dozen years?